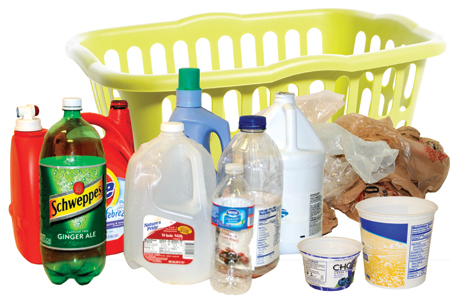 FROM PLASTIC BUCKETS to old lawn furniture, rigid plastics are the latest addition to Ocean County’s recycling stable. Following a pilot program in Lakewood Township where 13 tons of rigid plastics were collected in only three months, the county has decided to begin accepting the material at both the Northern Recycling Center in Lakewood and the Southern Recycling Center in Stafford Township, said Freeholder James F. Lacey. Lacey, who serves as liaison to the county’s recycling programs, said rigid plastics will not be collected at curbside and must be brought to one of the county’s recycling centers. This addition to the recycling program will not only save on landfill tipping fees, but also earn the county about $90 per ton in sales, he said. Rigid plastic items now accepted by the county include: plastic buckets including those with metal handles, milk and soda crates, laundry baskets, lawn furniture, totes, drums, toys and playhouses, pet carriers, pallets, coolers, shelving, closet organizers, dish drainers, empty flower pots, traffic signs, garbage cans, five-gallon water bottles, PET blister packs and computer housing without circuits. Plastic automotive parts are also accepted, including bumpers, bed liners from pick-up trucks, grills, side-view mirrors, headlights and rear lights and hubcaps. Materials not accepted include: PVC pipe and tubing, vinyl siding, grocery bags and stretch film, Styrofoam, coated paper orange juice and milk cartons, flexible water hoses, medical waste, yogurt containers and oil/chemical containers. Plastics can be dropped off at the Northern Recycling Center, New Hampshire Avenue in Lakewood, or the Southern Center on Haywood Road in Manahawkin between 7:30 am and 3 pm Monday to Saturday. Freeholder Director Gerry P. Little said Ocean County already boasts one of the nation’s most successful recycling programs.